I'm glad you reached like 60 this weekend. I couldn't even handle the weather. It was so warm out! Does this mean spring is around the corner? So can we just take a moment and talk about this duster. I've been searching for one for a really long time. Pink Blush sent this one over to me and I was just beyond impressed. I've said it many times before that I am a HUGE boutique lover. and I always find something more unique. I'm also loving this kimono and hello these shoes are amazing! I always love keeping the outfit simple. ripped jeans to look effortless. Pink Blush and I are giving away a $50 dollar gift card to one lucky lady! I need those shoes in my life ;) Such a stylish, yet comfy look! Cute outfit! Love that cozy sweater! Samantha thanks lady! This sweater is like a cozy blanket! So beautiful dear, I love the coat! 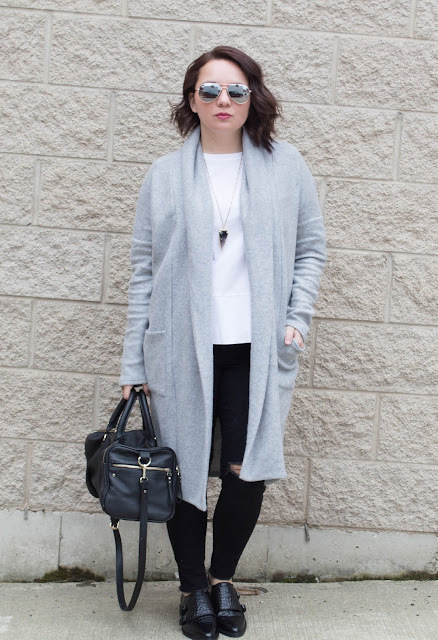 I love the gentle colour of this long-length cardigan and your decision to style it with the ripped black jeans is perfect! so simple and so chic. Perfetto! Cara, thank you so much! We have similar tones outfits today darling)) I love blush pink color and this company name sounds so good! Great style! Great minds think alike :) I am all about simplicity and soft shades! Those are some killer shoes, and I'm loving the neutrals - that's pretty much my entire closet! Thanks the shoes are wonderful and a perfect addition to my shoe collection! I love their clearance. I would shop off the clearance section. More bang for my buck. I love dusters! You look great! Neutral and cozy, with a touch of attitude in those super cool shoes. :) Love it, lady! Uhg grey is my COLOR right now!! haha! Great seeing you this weekend, doll!! Black and white with grey and flat shoes - my fave look for the office. <3 Looking fab, babe! Duster are great for completing a look. You look so cozy in this one. Thanks lady :) Making every outfit! Such a simple, chic #ootd, Jessica! Absolutely love it! And oh yeah, obsessed with Saturday's Chitown weather but it was kind of a tease! Though today is really sunny so I'll take that! Great look! Love the shoes ! Thank you so much :) I love those shoes too! Thank you! I can't wait to style them more! Gorgeous jacket! That color looks great on you! Caitlin thanks so much :) I love this color!! 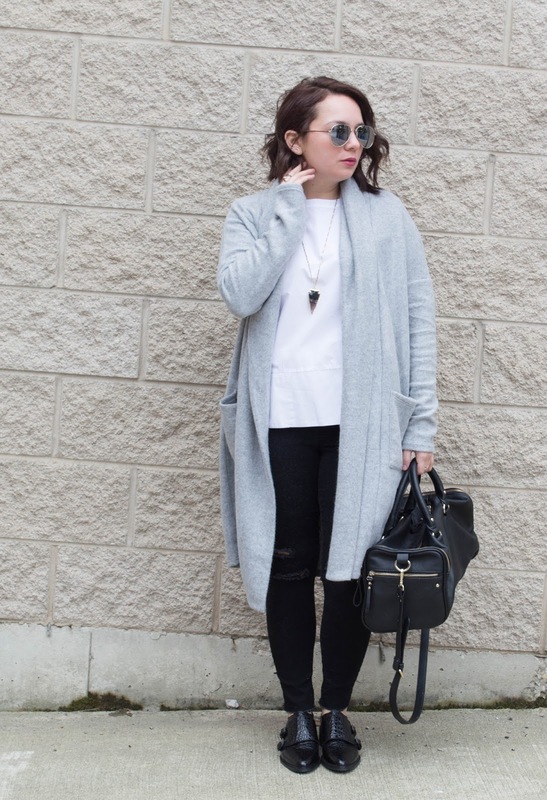 I'm obsessed with grey tones, and you look fabulous in them! Gotta love a Great Grey!! Can't go wrong with grey! Such a cute coat! 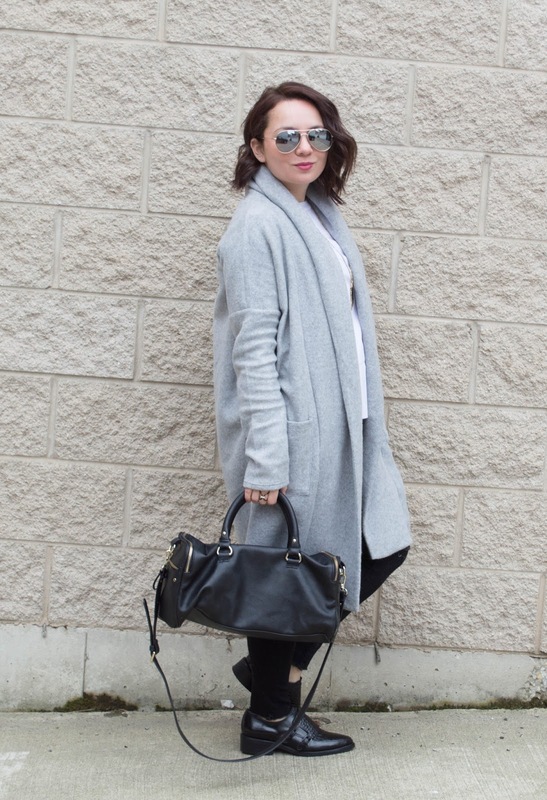 I love a good duster and I cannot say no to grey. Looking fab girl! Great look, that's kind of my thing, polished and minimalist! I would really like to get one of their maxi dresses!